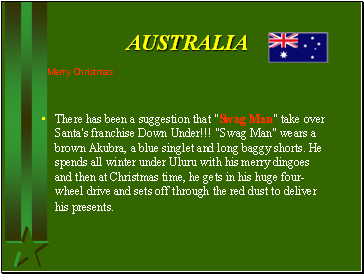 There has been a suggestion that "Swag Man" take over Santa's franchise Down Under!!! "Swag Man" wears a brown Akubra, a blue singlet and long baggy shorts. He spends all winter under Uluru with his merry dingoes and then at Christmas time, he gets in his huge four-wheel drive and sets off through the red dust to deliver his presents. 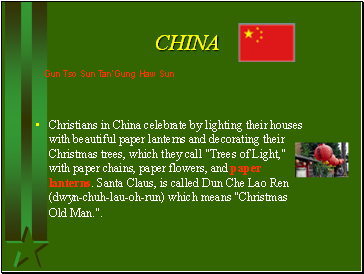 Christians in China celebrate by lighting their houses with beautiful paper lanterns and decorating their Christmas trees, which they call "Trees of Light," with paper chains, paper flowers, and paper lanterns. 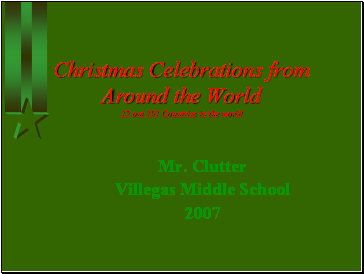 Santa Claus, is called Dun Che Lao Ren (dwyn-chuh-lau-oh-run) which means "Christmas Old Man.". 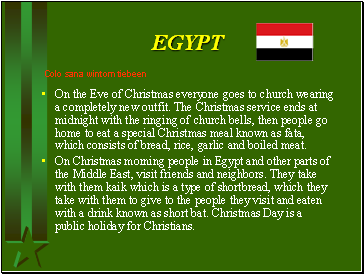 On Christmas morning people in Egypt and other parts of the Middle East, visit friends and neighbors. They take with them kaik which is a type of shortbread, which they take with them to give to the people they visit and eaten with a drink known as short bat. Christmas Day is a public holiday for Christians. Nearly every French home at Christmastime displays a Nativity scene or creche. 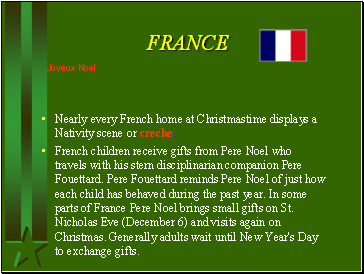 French children receive gifts from Pere Noel who travels with his stern disciplinarian companion Pere Fouettard. Pere Fouettard reminds Pere Noel of just how each child has behaved during the past year. In some parts of France Pere Noel brings small gifts on St. Nicholas Eve (December 6) and visits again on Christmas. Generally adults wait until New Year's Day to exchange gifts. The main exchange of gifts takes place on January 6, the feast of the Epiphany, the celebration in remembrance of the Magi's visit to the Christ Child. 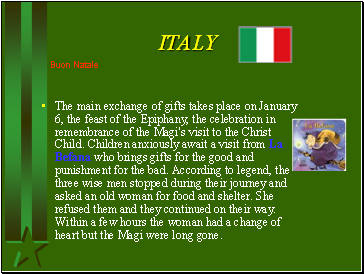 Children anxiously await a visit from La Befana who brings gifts for the good and punishment for the bad. According to legend, the three wise men stopped during their journey and asked an old woman for food and shelter. She refused them and they continued on their way. Within a few hours the woman had a change of heart but the Magi were long gone.